prolonged exposure to very high airborne mould concentrations resulted in major health consequences for the occupants of a Sydney apartment. Unsuccessful remediation attempts had exacerbated the mould contamination levels within the apartment, resulting in greater risk of inhalation of mould spores hyphal fragments and mycotoxins by the occupants. The rooftop membrane immediately above the apartment had been replaced twice previously but the moisture within the apartment structure remained high as no structural drying had been implemented. Additionally, one wall at the front of the building was allowing moisture ingress into the bedrooms. After hospitalisation of the male occupant, a mould assessment was requested revealing extensive visible mould throughout the apartment, confirmed by culture Aspergillus sp. and penicillium sp. predominated from surfaces and airborne sampling, and exceedingly high levels. Further sampling of the environment also detected mycotoxins. Figure 2 walls and ceilings of the main bedroom in the mould affected apartment. Unfortunately, the male occupant succumbed and his cause of death was stated as Difuse Alveolar Damage. No fungi were noted in the histology of the open lung biopsy taken prior to his death but the block was referred to our affiliated US laboratory for fungal PCR, confirming the presence of DNA from: A. versicolor and P. purpurogenum2. The remaining occupants Uriah and contained Aflatoxins Ochratoxins and Tricothecenes at high levels. However, only Tricothecenes were detected in the dust samples from the apartment1. From the start it has been concluded that the link between the mould present in this apartment and a substantial ill health suffered by the occupants, possibly leading to the eventual death of one of those occupants, has been confirmed. Recently our company was requested to inspect the home of a client who amongst others things suffered from multi chemical sensitivities- she had recently moved from her rear bedroom due to increasing reactions to that room affecting her health and ability to sleep. Our client had moved downstairs but found that downstairs exposure issues were even greater, after a period of time she made contact with us. Flir infra red camera showed no signs of moisture upstairs but down stairs we found moisture in the concrete slab in an area under the new kitchen, we were informed that the kitchen had been replaced the previous year due to a water leak from a dishwasher and that the particleboard floor upstairs under the kitchen had rotted and was replaced, but with the understanding that gravity allows water to affect anything underneath, we commenced testing of the plaster ceiling and bulkhead directly under the leak. As you can imagine high levels of fungi could be visually seen on the top side of the plaster, fungi was also present under the vinyl and behind the downstairs vinyl. Our scope to the client for this area was sealing up the room under negative pressure, removal of the ceiling, vinyl skirting boards, wall plaster, decontamination of all walls and exposed timber work. Drying the concrete slab before final clearance testing is carried out to ensure fungal and bacterial levels are very low. Our attention was then directed to the other end of the house where the client was first aware of reactions from the upstairs bedroom- here we were informed that both bathrooms had leaking issues with shower bases. This was addressed by tiling over one affected bathroom shower base and installing a fibreglass shower recess in the other. Due to the lack of knowledge by the tradesperson or our client no one had thought to look at the wall cavities or the floor. Using a boroscope into the walls around the main bathroom we could visually see fungal and fungal hyphe, (white and blue fluorescing hyphe) Underneath the house where moisture had affected the particle board floor under the main bedroom bathroom- the particle board was actually crumbling and had lost any structural integrity. We cultured the affected particle board flooring and found Aspergillus sp. Penicillium sp. 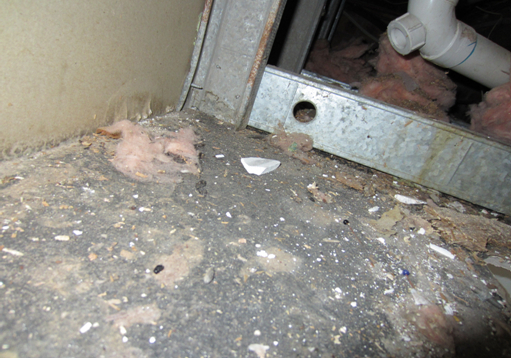 and Stachybotrys, these fungi were found both on the underside of the flooring but also within the particle board. Our client suffers from MCS and there is evidence that MCS can be initiated by some types of toxic mold, and although it’s not exactly clear through current research which mycotoxins are implicated, there is evidence that Stachybotrys molds may be involved especially when present in “sick buildings.” Once MCS is initiated, the person develops hyper sensitivity to low levels of those same toxic chemicals and others— ubiquitous in the home, work place and environment— which results in chronic ill health often becoming serious and disabling. When it was revealed that this room had been contaminated by Stachybotrys the room was immediately sealed off, affected contents removed and the walls around the bathrooms were opened up, all materials doubled bagged while the room was under negative air, all exposed surfaces were HEPA vacuumed and then cleaned with a non bleach based mould cleaning solution. Naturally staff where in full PPE. Building works under our guidance will strip out the bathroom and floor, after which decontamination will continue with the room being sealed until a successful clearance has been achieved. The exposed flooring will be covered and our client will then determine before rebuilding works are undertaken that there is little or no exposural issues. When the building works have been completed we will heat up that area to off gas new building components before our client moves back in, speeding up the off gassing will decrease any exposural discomfort to an MCS affected person. 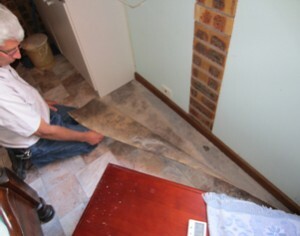 Our client and ourselves hope that this remediation maybe a way of her being able to better deal with her health issues. If the medical world was attuned to these sufferers then it would be great to see their oxidative stress levels monitored both before and after removal of triggers have been completed. As a testing and remediation company we have been lucky enough to have been involved with families like the Charles family where with testing we had been able to show their rental accommodation was badly affected by mould and possibly causes defined health issues within their family, when we decontaminated their contents had them move out the results were astounding as you can see from their letter to our remediation company. What a journey it has been. I don’t know how we would have made it throughout this ordeal without you and your team. As you know we had been living in a house with mould contamination for just over two years. The mould contamination progressively worsened as time went on and when our overall health had deteriorated dramatically, we became seriously concerned. As you know, we have two daughters. Our two daughters suffered with colds constantly and our youngest suffered from bronchitis throughout this 2 year period, and during this time developed asthma which required 2 inhalers of various strengths of potent steroids. Both my husband and I suffered from serious fatigue and in the winter of last year I developed a chest infection and then a secondary infection followed that. Once I became ill, it was a very long time to before I showed any signs of recovery. Throughout the duration of living in this house we started noticing an increase of mould throughout the premises. At this point, we decided to take samples of the mould both visible and no visible and have it tested by a lab. The results were astonishing. We were living with extremely high levels of mould in the house. Thanks to you and your team, we have been thoroughly educated on the effects of mould. You advised us that the contents of our house had to be decontaminated before they could be moved to a new location. You and your team were extremely thorough on the decontamination process – I don’t know how we would have survived the move without you. We have totally benefited from your knowledge and experience in this area and your attention to detail in such a serious matter. It has now been 5 months since our move and we definitely see a significant change in the health of our family. Our youngest daughter who suffered from asthma has been 100% healthy since living in the new house – she no longer relies on steroid inhalers and the rest of our family is fighting fit. Now that we’re in a healthy environment we can really see the serious effects that mould can have on your health. Thanks again to you and your wonderful team! Elidemir O, Colasurdo G, Rossmann S. “Isolation of Stachybotrys From the Lung of a Child with Pulmonary Hemosiderosis.” Pediatrics 1999; 104: 964 – 966. Summary: A 7-year old boy was diagnosed with pulmonary hemosiderosis (chronic bleeding in the lung) and Stachybotrys chartarum was cultured from fluid removed from his lungs. He had been well until age 5 when his family moved into a house that experienced severe flood damage. The house was being repaired in stages by his family but still had significant contamination with Stachybotrys chartarum, as well asPenicillium andAspergillis species. After a short time in the house he developed pneumonia followed by a chronic, non-productive cough, intermittent, low-grade fever and decreased appetite. No one who lived in the house smoked cigarettes. After diagnosis he lived in another house for 2 months until his damaged house was repaired. His symptoms resolved and he was symptom-free 10 months after diagnosis. Comments: While this is only one case report it provides strong evidence that Stachybotrys chartarum inhaled from one’s home can cause pulmonary disease similar to the pulmonary hemorrhage identified in the Cleveland infants. 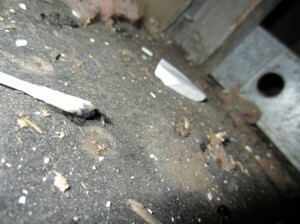 Although Stachybotrys chartarum as well as other fungi was identified in the house no air sampling is reported. At this time there is no information regarding the level of airborne exposure that is necessary to cause disease. 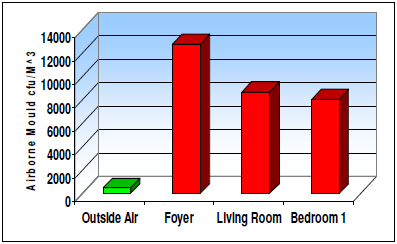 This report adds to the evidence that living in moldy environments can be injurious to one’s health. It is also interesting to note that the house was successfully decontaminated. Our company was approached by a client who was suffering from skin problems which she thought was due to some form of bug from within her unit which she believed was crawling on her skin. She had the unit treated by various pest companies but with no real ongoing results, as well the unit was inspected by a white ant inspector who tested the unit and reported that it was dry and no white ant issues. Further discussion with our client revealed that she had noticeable odours when she left the unit closed up for prolonged periods of time. It was agreed that our company should attend and take samples to see if we could also find similar fungal hyphal with growing tips. A walk through of the unit with an Infra Red Camera pin pointed a number of areas of concern to include carpets, walls and skirting boards around the bathroom, which were then validated with a protimeter moisture meter. Lifting of carpets also confirmed the results indicated by the protimeter with underlay being wet in the hallway and two bedrooms. Mould was sampled in the unit in the dining room under carpets and found to be confluent, with hyphal fragments with growing tips the same as what was identified from skin samples. As a fungal testing and remediation company there have been hundreds of cases where contamination has been reflected in the individuals health and that removal of that contamination has simply lead to improvements in their health. Should you have any questions at all regarding contamination at home or your workplace don’t hesitate to ask any questions you may have no matter how insignificant you might think they area. Sometimes changing your environment may result in a dramatically improvement in your quality of life.